It has been over six months since the last official release of Gimp2.0. We are not too far away from official release of Gimp2.2. The Gimp2 release was a big jump in terms of features and Interface over Gimp1.2x series. Largely this was due to the change in underlying UI from GTK1.2 to Gtk2. As I had said last time in the “Gimp2 an introduction” article we are in for better times with Gimp2x series blooming as a professional image manipulation ‘product’, yes the numerous enhancements that we are witnessing are only lending more weight towards gimp being an full featured product rather just another good open-source program. 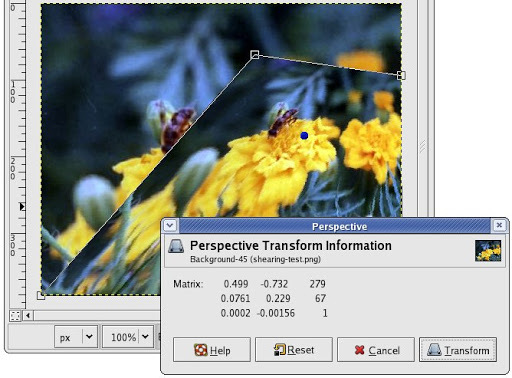 There are numerous additions in the Gimp2.2pre. Firstly the latest release of GTK2.4 has been used and it makes possible further improvements in the Gimp2.2 Interface. This is especially noticeable in the system interaction dialog boxes like file open, close etc. 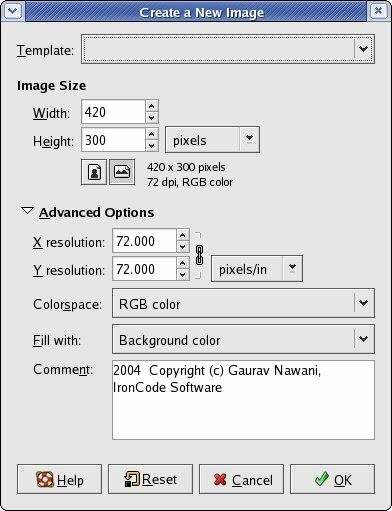 Gimp2.2 have been re-worked a lot to confirm to the Gnome Human Interface Guidelines (GHIG). Result is well-organized dialog boxes and cleaner interface. Since the help documentation is ready for almost everything, most of the tools now sport a help button. Image-1. Default file new dialog box. The input-output dialog boxes are now smaller put only simple info for the new users. Notice the default file new dialog box (image1) and after expanding the Advance options (image2). Image2. File new dialog box after expanding. You will also notice that the amount of textual information from the dialog boxes has also been reduced along with UI element clean up. The file size info from the ‘file new’ dialog box is gone now. 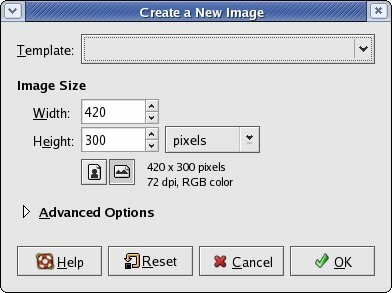 I feel it was useful for new users since it made it easier to make decision on creating an image, which is within your hardware’s limits. 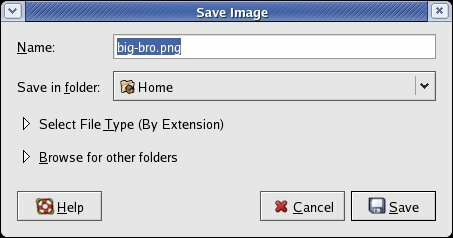 Similarly the file save as dialog box has been much improved upon to provide a nice simple interface to the user (see Image3). 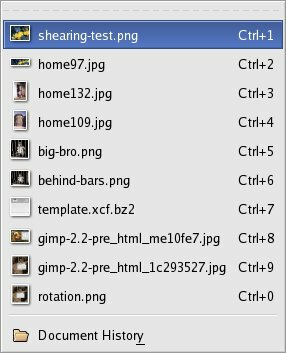 The other small addition in the Interface is the inclusion of an active image preview in the main toolbar and also the recent menu now shows the iconized preview of the file along with the file name (see image4). The quit dialog also offers the user preview of active images along with name, if user quits before saving any modified image. Image3. File save Dialog box. Image4. The recent file menu. 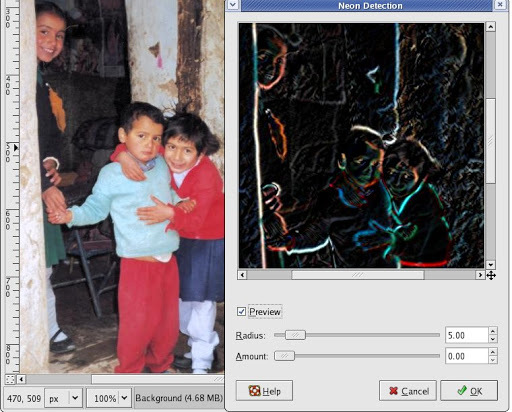 The one completely new feature in Gimp2.2pre, which will instantly find your favour, is the amount of interactivity. 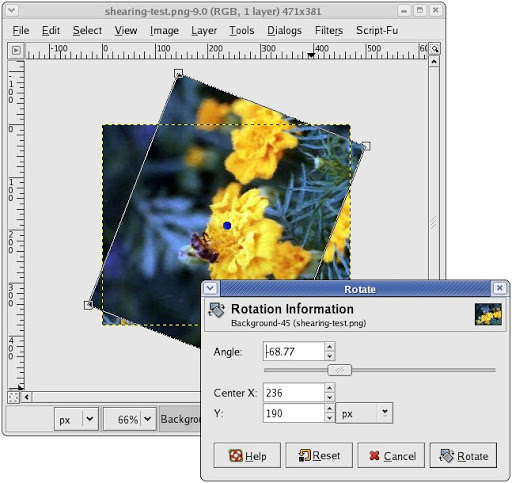 The transformation tools like shearing, rotation, perspective, cropping and layer size are now fully interactive, it means you get real time preview of what you are doing while you drag the control points. Despite its late addition it however was a necessary feature for any graphics manipulation program and it was a shame that it was missing for so long. The transformation tools now also have additional manipulations like constrained, fixed ratio etc, depending upon the tool selected. 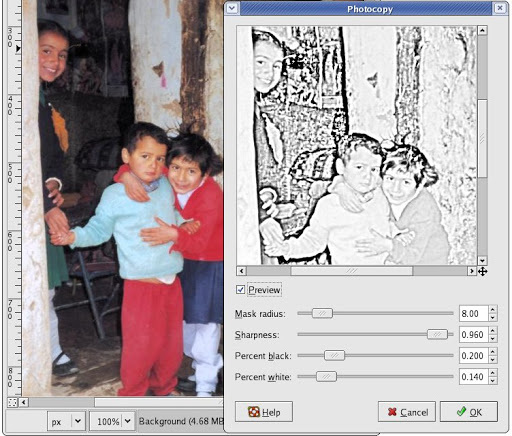 The cropping tool is also modified and now it shades out the part, which is not inside the cropping zone. 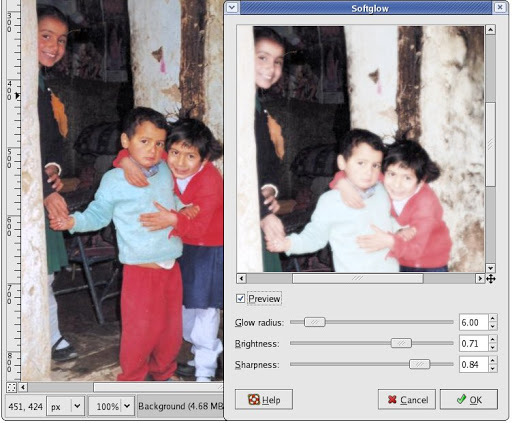 Gimp2.2pre now have real-time preview for almost all of the filters, further the size of the preview is not limited as was the case earlier. In most of the dialog boxes now, you can expand them and the preview pane size will automatically increases with it. Image9. 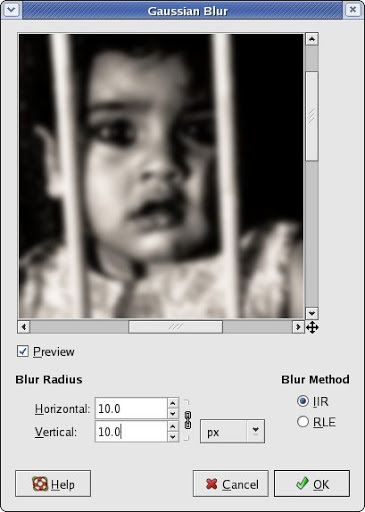 The increased size of blur preview pane. Few of the features have been renamed and/or moved like the Filter Noise Noisify has been renamed to Filters Noise Scatter RGB. The Scatter RGB does not produce noise on transparent layer any more. However that is not much of a problem if you know how to get along. Further the ‘Gaussian blur’ the “blurring brother’s at arms” have found a new home within a single dialog box, Neat!! (See image 9). 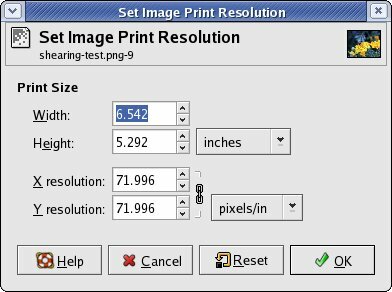 The image print size, which was removed from the ‘file new’ dialog box, is now moved to another place in Image Print size. It is quite adaptable to various needs. You can have the size info in the format of your choice like millimeters, inches, feet, DPI, centimeters etc. Image11. 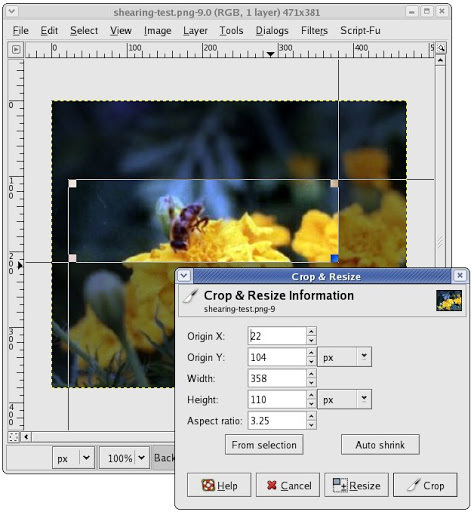 The Gimp’s rounded rectangle tool. Interestingly one more very important part of the reshuffle or change comes at filters Script fu Selection roundness. It is removed from there and there is a new addition of a tool in the selection menu called ‘Rounded rectangle’. Anyway it now makes the use of the rounding selection faster and also with better control. 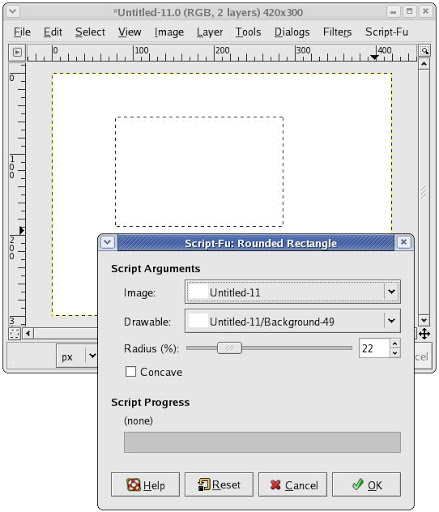 You can convert any selection to a rounded rectangle with this (See image11). No more hacking with level tool (if someone was used to that :). 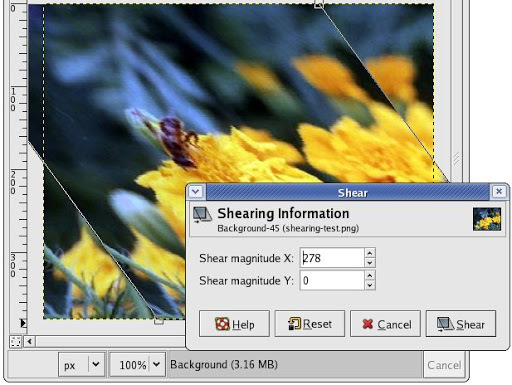 The Gimp2.2 now have support for more formats, most noticeable being AutoDesk FLIC animation (*.fli, *.flic), Alias PIX (*.pix,*.matte, *.mask and *.alpha…) few more formats of sun and Silicon graphics are now supported. This is where the Gimp2.2 will be much stronger than its predecessors. To bring clarity and cohesiveness, most of the tools have been reworked for better UI. For example the Gfig tool, it now looks and behaves like an inbuilt feature. There are five new filters added in this release and they are Cartoon, Neon, photocopy, Softglow, reintex and Dog (unfortunately dog is buggy in this pre-release and I couldn’t use it). Image12. The Gimp’s cartoon filter in Filter>>Artistic>>Cartoon. Image13. Gimp’s Filters Edges Neon. Image14. Gimp’s Filters Artistic Photocopy. Hmm… is photocopy artistic?? Sure is. Now no more hacking for the photocopy effect, as it is few clicks away. Image15. Gimp’s Filters Artistic Softglow. Not much to look at for professional users as it is a relatively simple trick. Image16. 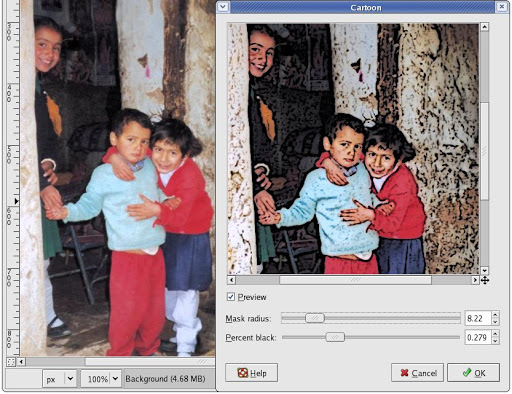 Gimp’s Filters color reintex. 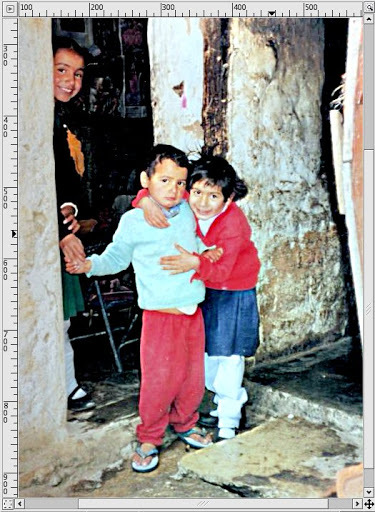 There is an addition of view percentage and changing of the measurement format in the lower left part of the image window’s status bar. You can now change the padding color of your choice. View>>Padding>> color. Layer>>Align>>visible. A neat addition to manage layer positions automatically. Though this might do better with more improvements. Image>>Guides. Again a good addition to managing guides bit better but still could do better with more features. The File>>Preferences dialog box was again trimmed and now look more organized, good for new users, as usually advanced options are also there but hidden. Switching out of view no longer cancels the recent the change while using filters. Gfig has now its own layer behavior much like the text. Image>>Units. A new entry, which shows all the type of measurement and conversions along with their descriptive names. Open any SVG image from the file open menu and the image is automatically rendered as an image. Filters>>Light effects now can have more than one light source. The data transfer between other applications like Openoffice and Abiword has been improved a lot. Gimp2.2pre Scores at virtually everything it included save for the new slower file openings times. But then it was due to some bug in the newer GTK, which after begin, resolve will be removed anyway. And that will happen before the Gimp2.2 is officially released. Everyone who has not done an up-gradation in past six months would definitely like to move to Gimp2.2 or even Gimp2.2pre as it is stable and it offers lots of goodies that you wouldn’t want to miss in your favourite Image editor.